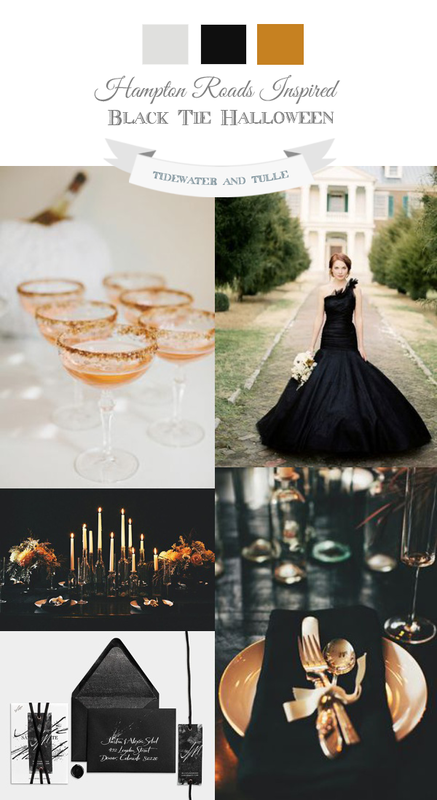 With Halloween just around the corner, it's only the best time to share a spooky chic wedding inspiration board! What if you love the holiday but have dreams of a black tie gala? Well, my friends, embrace the always elegant black! You can don a stunning black gown (for your reception or all day!) or a formal tux avec bowtie. And by incorporating burnt orange metallic or copper-infused details in your cocktails and centerpieces, it adds a rich dimension to any romantic setting. The historical inspiration comes from Colonial Williamsburg. Popular for classic and elegant weddings, the Historic Area is a step back in time to 18th Century America. You can't help but love the fall season when ghost walks and haunting rumors are very popular. After all, it is considered the "Living Museum"… now however you interpret that, that'll be up to you! But if you care to indulge in some spooktacular tales, HauntedHouses.com has some of my favorites from Colonial Williamsburg.